Mobile Tyre Shop commenced operations today (6 July 2018) in the ‘City of Churches’. 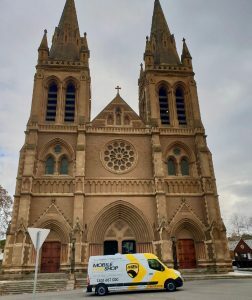 First launching in Melbourne in 2012 and featuring on Network Ten’s Shark Tank, Mobile Tyre Shop now operates in 4 states with company owned vans servicing Melbourne, Sydney, Brisbane and now Adelaide. Mobile Tyre Shop has taken the hassle out of buying tyres by bringing the tyre shop straight to the customer 7 days a week. Disrupting the traditional tyre shop model customers can now get their tyres conveniently fitted at their homes or work. While mobile tyre servicing is innovative to Australians, countries such as the USA and those of Europe have long been used to the convenience of getting their tyres changed at home or at work. Heading up the operation in South Australia is Shameel Hay, who is excited to be making Adelaide his family’s new home having worked with Mobile Tyre Shop in Melbourne. As one of the most experienced Tyre Technicians, ‘Shamy’ saw this as a great opportunity to not only progress his employment, but to also give his family a better lifestyle in South Australia. For a list of Suburbs that Mobile Tyre Shop services in Adelaide, click here.